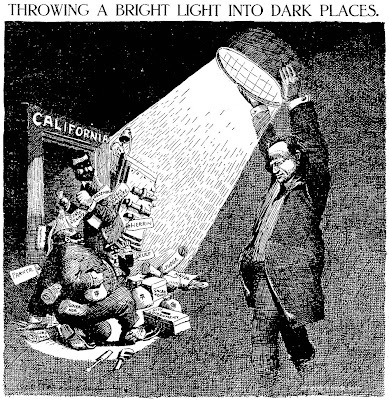 Four editorial cartoons this Saturday, originally published October 9 - 12, 1906. Interesting tidbit about the second one is that Herriman seemed to be planning to have a little fellow climbing up Langdon's back. There's a vague outline in the cartoon that was never completed -- I removed what little there was in the cleaning process. The last cartoon has Herriman giving us a cat, not yet a kat, as the central figure. Ken Kling is middling famous as the creator of Joe And Asbestos, a strip that ran for many years, most of that time only in a few New York papers. The strip, which had started out innocently enough in 1923 as a Barney Google rip-off, eventually turned into a horse-racing tip strip. We'll get further into that story some other day, though, since today we'll look at Kling's second most successful strip, Windy Riley. Kling ended his first run of Joe and Asbestos in 1926 and didn't start this new strip until December 12 1927 (the samples above are the first week of the strip). In between he may have taken a detour to the McClure Syndicate to do another run of an earlier strip, Those Folks, but to me the 1926-27 run of that strip looks to be reprints. Sorry, digressing again. Anyhow, Windy Riley, as the name suggests, was a young gasbag. He was home from college determined to set podunk Scramsburg on its ear. Riley was an inveterate schemer, always on the prowl for a quick buck. When not scheming for dough, Windy was busy wooing his sweetie, the delightfully named Sheila Gree (I'm betting the name was cribbed from a George McManus strip). As the strip wound down, Windy did finally win the fair maiden and in the waning weeks of the strip the two were married and off to Atlantic City. The strip ended sometime early in 1932, probably late January or February, though you'll see 1931 cited in the history books. Kling then revived Joe and Asbestos for a second much longer run. Windy Riley was by no means a great strip, but Kling infused the proceedings with so much joie de vivre that it's impossible not to like it. If you get a chance to read more of the strip be sure to take it - it's really a blast. Hello, Allan----WINDY RILEY was also made into a two-reel comedy, WINDY RILEY GOES HOLLYWOOD (Educational 5-3-31). Ken Kling supposedly wrote the story. The film was directed by Roscoe "Fatty" Arbuckle, and starred Jack Shutta as Windy, and Louise Brooks as his girlfriend. It's typical of Educational's product of the period, that is, pretty bad.-------Cole. 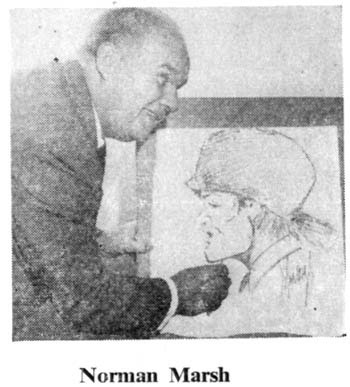 "Would that more cartoonists might go barnstorming," writes Charles B. DePuy, managing edi­tor of the Centerville (Iowa) Daily lowegian and Citizen, and reports that a visit from Norman Marsh, creator of "Dan'l Hale," "gave zip to local as well as area circulation." Centerville was one of over 30 cities scheduled to be visited this fall by the cartoonist, who syn­dicates his own comic strip from 1234 W. Lake St., Chicago. A per­sonal visit to towns where "Dan'l Hale" appears is now a regular biennial feature of Mr. Marsh's service. Last year, on his first coast-to-coast tour, the cartoonist covered 21 cities and visited students and teachers at 167 schools. Schools are an important part of Mr. Marsh's barnstorming tours, for "Dan'l Hale" is used in many history classrooms. Dan'l is a frontier scout in the early years of America's development, and his adventures bring him into contact with many historical per­sonages and events. Details of history are carefully checked for accuracy, and authenticity has never been questioned in the strip's five-year life, the cartoonist proudly reports. "Kids don't read nowadays, what with radio and television," Mr. Marsh recently told one of his subscribing newspapers, "but they will read comics. And I can give them American history in the way they like it." Mr. Marsh started "Dannie Hale"—the first name was changed to "Dan'l" earlier this year—for King Features Syndi­cate in 1947. In January, 1951, he took over his own syndication, and is doing "very well, thank you." No cancellations in over a year. 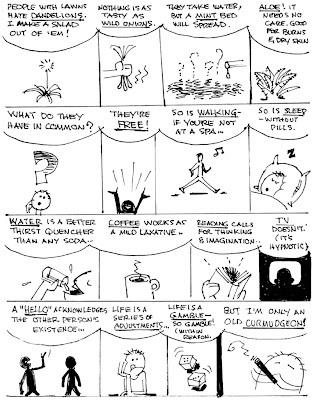 The cartoonist's own life has been at least as adventurous as his hero's. He served in the Marine Corps in both world wars, enlist­ing at 16 in the first and com­manding a line company in the second. In the rest of his 51 years he has worked as a prizefight manager, sailor, pilot, speculator and detec­tive. Previous comic strips include "Dan Dunn" and "Hunter Keene." 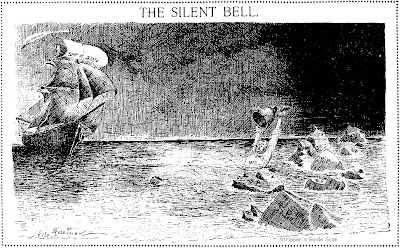 Here's another of those St. Louis Globe-Democrat strips done by one-man Sunday section filler DeVoss Driscoll. Here we get Driscoll at his best, drawing animals in a humorous but realistic manner. 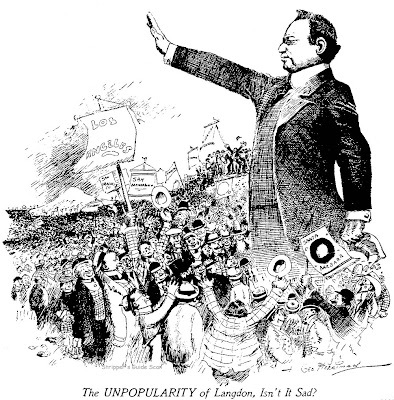 He really was an unsung master of this little cartooning niche. 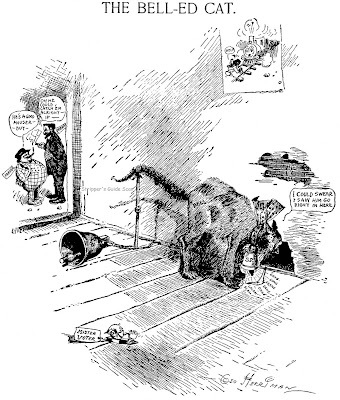 Animal Antics ran in the G-D from November 22 1903 to April 24 1904. PS - Stripper's Guide News -- My crappy scanner, the ultra-cheapo Mustek A3, that I bought out of desperation when my wonderful Microtek Scanmaker unexpectedly bit the dust, has finally annoyed me to the point where I went out and found a used high-end scanner. This one is an Epson Expression 1640XL, which originally sold for over 2K, but I picked it up from NASA surplus for $400. If all goes well and I can get it to work, maybe, just maybe, you'll be seeing some better quality color Sunday scans from me. The Mustek, for the price, is a fine scanner, but it really hates scanning old toned newspapers, and its extremely limited focal length turns strips into a blur if the paper isn't absolutely, perfectly flat ... and its practically impossible to get a Sunday page to lay that flat. A gag-a-day comic strip based on the top-rating "I Love Lucy" television show is offered for De­cember 8 release by King Fea­tures Syndicate. Though main characters in the strip—bandleader Ricky Ricardo, his flighty wife, Lucy, and, in a few months, a new baby—will be patterned after the television pro­gram, the strip will not adhere rigidly to the TV show pattern. Original subsidiary characters will be introduced, and the daily gag form will be used in place of the TV situation humor formula. Like the television program, however, the strip is designed to appeal to all age groups. According to the CBS television network, the two-year old show is now carried on 64 stations-a "full network"-and has a higher Nielsen rating than any other program now broadcast. A full-scale merchandising campaign featuring adult products was launched recently. Artist on the new strip is Bob Oksner, whose work has appeared in slick magazines and comic books and who once drew a news­paper strip called "Cairo Jones." 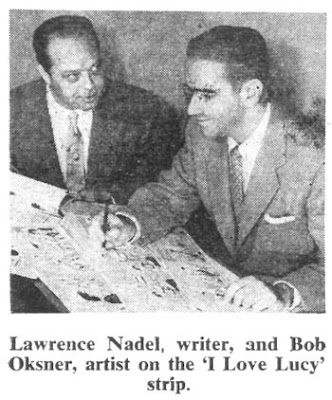 Lawrence Nadel, who has written and edited comic books and has written for radio and television will be the author of the daily "I Love Lucy" strips. 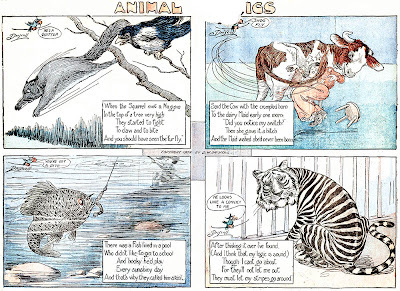 The strip is available in four and five-column width, six re­leases weekly. If you have any samples of "I Love Lucy," I would be interested in seeing them on this blog. I do have a comic book which reprinted the frist few months of the strips. If you are interested, I can mail you some of those! Hi, Allan. I'm the creator of the Blockheads cartoon you cited. Anyone who wants to see samples should go to http://www.johngile.com/faqs.htm#blockheads.